I know whereof I speak. As a twentysomething man I slept on floors, in sleeping bags and then spent a moderate sum on a set of basic cotton sheets when I got myself a proper job. 2 years later my girlfriend (now my wife) threw them out. She said that one of the secrets of a happy relationship is Luxury Bedding. You don't need to spend a fortune on may things in life, but the highest quality bed linens are worth finding. The benefits of getting a good nights sleep in absolute comfort are nowadays all too clear. In addition, the warm feeling we get from pampering ourselves with a beautiful bedroom with high quality bedding makes us feel better about ourselves and life in general. Our partners enjoy the experience of coming to bed. Despite what my wife said, I never really felt strongly about bedding until I stayed at a luxury hotel in Wales a couple of years ago. 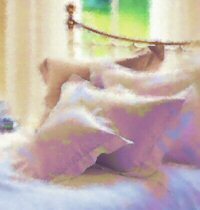 The experience of climbing into their bed with ultra fine linen was a revelation to me. I was over 35 years old and had therefore 'got into bed' about 13,000 times in my life but had never had such a sensuous, cool and comforting sensation as sliding between those sheets. The next morning having awoken from possibly the best night's sleep of my life I spend 10 minutes scrabbling around the edges of the duvet to find a label with the name of the company that provided the bedclothes. FYI, it was The White Company and the bedding was their luxurious Egyptian cotton percale. Silk is without doubt the most luxurious bedding material available, but silk sheets are cold to the touch and so if you live in colder climbs, then you will probably opt for cotton instead. 100% Cotton Percale weave is really the most luxurious cotton bedding material. Its all about the thread count. Most high street linens have a thread count of around 160 threads per square inch of fabric. However, a thread count of 300 threads per square inch of fabric or more is what gives you a luxurious a silky feel against the skin. There is a threshold of about 600 threads above which there is no real need to go since unless you have hyper sensitive skin, you are unlikely to be able to differentiate the difference. However the cost of 600 thread cotton is very high. 400 thread cotton is almost as good and in fact is what we have in our guest bedroom at home. When choosing Luxury Bed Linen for your own home, do not forget to use your own sense of touch to decide the cotton you want to sleep on. Luxury bedding is ultimately a matter of personal taste. You can use beautiful bed linens to turn your bedrooms into havens of peace and tranquility for you, your family and your guests. Luxury Bedding is available from many manufacturers but there are specialists in the luxury end of the linen market and these are the ones to go for. As I said earlier, the White Company of London is a company I will happily vouch for. John Lewis also have a great reputation for Bed Linen. Look out for Egyptian cotton. Cotton from Egypt is generally of a higher thread count than most other cottons and is therefore smoother to the touch and very strong. There is also a 'satin' process that makes even cotton sheets feel like silk.